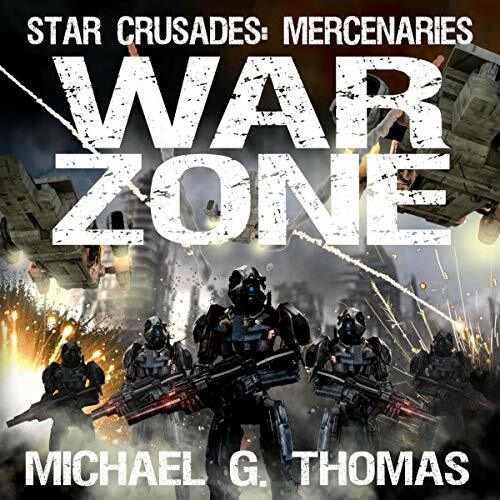 Warzone is the fifth novel in the epic new Mercenaries series that chronicles the violent struggles of humanity in a brutal and ever changing galaxy. The war rages on, with no sign of victory for either side. Spartan and his loyalist soldiers win battle after battle against the Star Empire, but they are losing the war against this new and invigorated foe. Every day, more heavily armed troops arrive to bolster the enemy. Many of Spartan's exhausted Byotai allies want to surrender, but he will never back down, no matter the odds. He promised to fight this war, and fight it he will. Spartan takes his mercenaries, and what remains of the militias, deep underground. There they fight a desperate subterranean war, trading lives for time before reinforcements can arrive. Spartan needs help, and only one man can help him achieve final victory. Hundreds of light years away at Taxxu, Commander Gun prepares a massive flotilla in secret, to assist in the war. Yet even as his ships, war machines and soldiers prepare themselves for the fight they are betrayed attacked by an enemy from within. This assault threatens to halt their rescue effort before it begins, and to tear apart the Alliance once and for all. As the fighting spreads through Taxxu, something awakens from its long slumber deep inside the old domain of the Biomechs. Something long thought dead and lost to time. Warzone is a futuristic military sci-fi adventure that continues to expand the violent struggles of humanity during a time of Galactic upheaval. It is a classic work of realistic military science fiction, set against the aftermath of the apocalyptic Biomech War. A conflict that has left entire planets destroyed, and millions of citizens dead.